Dmitar Berbatov, the Bulgiarian double goal made Boxing Day look good as United registered victory over Sunderland and beat them 2-0 and secured three points to stay on the top of the table. This encounter at Old Trafford led United to an unbeaten 17 games run, this all came in a roaring crowd of 75,269. 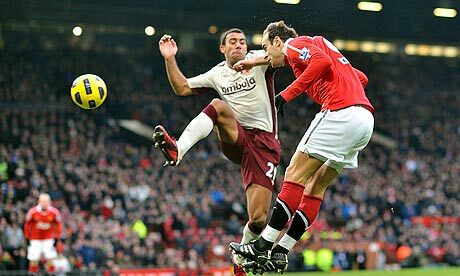 Berbatov who had been invisible with his performance for some time, made some early impact in this game. In just the 5th minute into the game he made his first goal with a header as a result of Rooney's cross, and after that there was no looking back. Later in the first half Manchester United came onto making chances for them selves with Berbatov making the first one with hitting the post and Anderson also un-succesfuly made a shot to the bar.This eventually ended the first half 1-0.With the second half into play , Berbatov was again into action and in 57th minute he deflected a shot from just inside the box, enhancing United lead to 2-0. This eventually remained unscathed lead with Steve Bruce's team remained under tremendous pressure and could not be of any threat to United.It took Sunderland about 25 minutes into the game to find something to make United worried when Boudewijn Zenden tried to get past the United defence. But Vidic was on hand to take over the midfielder and clear the danger. However, Sunderland could not make much impact with the ball , they were able to secure two yellow cards, one in each half Bardsley in the 23rd and Meyler in the 73rd minute.Their only shot on the target came with just 12 minutes remaining ,but Van der Sar was easily equal to Zenden's effort. With Ferguson's team was able to get the victory under the belt with also keeping the top position in mind too they did it with style. Anderson and Vidic came into back into the side after the duo recovered from flu, but Nani was not so lucky as he was left out of this encounter. Ryan Giggs also played an instrumental role as well. Darren Fletcher also missed out on this one, while Michael Owen, though recovered from injury remained on the bench. Manchester City are now just two points behind the Red Devils now as they secured 3-1 victory over New Castle.